Dr. David Anderson became Dalhousie University’s 13th dean of medicine on July 1, 2015. Born and raised in Halifax, Dr. Anderson graduated from Dalhousie Medical School in 1983. He completed an internal medicine residency at Dalhousie and went on to McMaster University for additional training in hematology. While studying at McMaster, he held a research fellowship in thromboembolic disease. In 1992, Dr. Anderson returned to Nova Scotia. He joined the QEII Health Sciences Centre (QEII HSC) as a staff hematologist and Dalhousie Medical School as an assistant professor. Not long before deanship, Dr. Anderson was head and district chief of the Dalhousie’s Department of Medicine. Under his watch, the Department of Medicine developed a strategic plan that lead to major new initiatives in clinical care, education and research. An accomplished teacher and mentor, Dr. Anderson has been a member of countless university and hospital committees. He’s also worked with the Nova Scotia Department of Health and Wellness – as clinical advisor for the Nova Scotia Blood Program and in the development of the new academic funding plan (AFP) process for clinical departments. In addition to his responsibilities as dean, Dr. Anderson maintains his clinical practice at the QEII HSC. With more than 150 peer-reviewed publications to his name, Dr. Anderson’s contributions to research have led to national and international recognition. He’s a founding member and former chair of the VECTOR Research Group, a multi-centre Canadian collaborative team focused on studying blood clotting disorders that, to date, has received more than $50 million in funding. 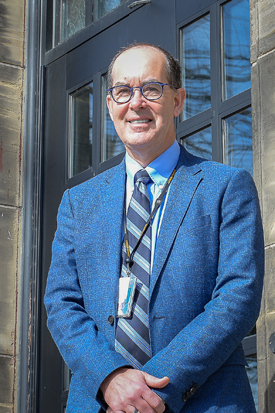 He’s also chaired the Department of Medicine’s research committee for nearly 10 years, and was appointed Dalhousie Medical School’s assistant dean of clinical research in 2010. A competitive tennis player and family man, he’s married to Michelle Karis. Together, they have three children: Phillip, Deanne and Karis. I enjoy sports – particularly tennis. If you could only bring one artist’s music with you to a desert island, who would it be? If you were to leave academia and go into any career you wanted, what would you choose? My wife. Time is precious. Would choose to spend it with the love of my life. Learn more about the people helping lead Dal into its third century.